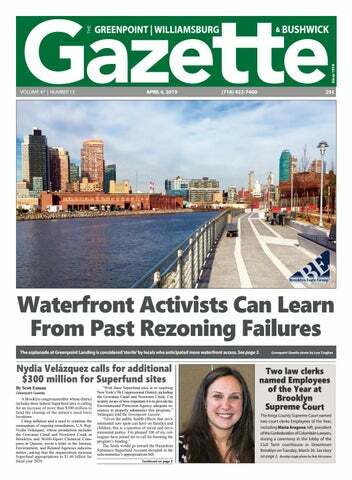 Waterfront Activists Can Learn From Past Rezoning Failures The esplanade at Greenpoint Landing is considered ‘sterile’ by locals who anticipated more waterfront access. See page 3. A Brooklyn congressmember whose district includes three federal Superfund sites is calling for an increase of more than $300 million to fund the cleanup of the nation’s most toxic locations. Citing inflation and a need to continue the momentum of ongoing remediation, U.S. Rep. Nydia Velázquez, whose jurisdiction includes the Gowanus Canal and Newtown Creek in Brooklyn and Wolff-Alport Chemical Company in Queens, wrote a letter to the Interior, Environment, and Related Agencies subcommittee, asking that the organization increase Superfund appropriations to $1.46 billion for fiscal year 2020. From left: Maria Aragona, honoree, Hon. Kenneth Sherman, Hon. Lawrence Knipel, Andrew Wenzel, honoree, Hon. William Harrington, Hon. Bernard Graham and Charles Small. Velázquez sent a letter last Thursday to U.S. Rep. Betty McCollum of Minnesota, the chairperson of the subcommittee, requesting the increase in funds. A presentation to the Community Board 6 Waterfront Committee last week showed a bold vision of a future Gowanus Canal: public spaces and on-water access, community gardens and rock climbing — and, of course, boat launches. The March 20 presentation came courtesy of the Gowanus Dredgers, a canoe club that advocates for recreation and restoration of the Gowanus Canal. Now that the notoriously polluted waterway is in the center of a neighborhood rezoning, activists like the Dredgers are attempting to get ahead of the curve, laying out an expansive vision of what waterfront design could be in Brooklyn. Owen Foote, a member of the Dredgers, said they wanted to avoid the city laying down the same underutilized waterfront esplanades from every previous project along the Gowanus and are instead advocating for “integrated waterfront service facilities,” ranging from boathouses and floating walkways to dining and public space. As the city prepares plans for the rezoning in Gowanus, residents are speaking out against the high-rise development and the increased density that comes with it. But one of the defining elements in the neighborhood — the canal — provides an opportunity to capitalize on lessons learned in Brooklyn’s previous waterfront rezonings. Promises made, promises broken When the Department of City Planning presented a rezoning proposal to the Community Board 6 Land-Use Committee in February, the Waterfront Access Planlooked like a standard New York City waterfront design: visual corridors between developments, public esplanades with curving pathways, benches — and very little interaction with the water. Asked if the city would consider ways to increase access along the waterfront, a DCP spokesperson said the agency was “looking to craft a modified version of them in the Gowanus Waterfront Action Plan, to address the Gowanus Canal’s unique geography, to promote resiliency and sustainability and to meet the community’s vision for the area.” The city made a similar effort back in 2009 toward innovation in the Williamsburg/Greenpoint waterfront rezoning, adding a text amendment to city waterfront design that was later adopted citywide. The amendment expanded design standards from a strict, all-guardrail approach on the city’s waterfront to allow for newer approaches to waterfront access, like riprap shorelines, which are constructed from boulders, or get-downs, which provide types of stepped access to the water. But a decade later, as high-rise condos of 30 and 40 stories spring up along the North Brooklyn shoreline, residents are worried they aren’t getting what they were promised in the rezoning. North Brooklyn residents gathered in Greenpoint last December to discuss waterfront design and development with representatives of the DCP. The meeting was initiated by the increasingly vocal dissatisfaction of Williamsburg and Greenpoint residents with the reality of design along the waterfront. When the publicly accessible space at Greenpoint Landing opened last year, residents found the design sterile in comparison to original discussions. The bulkhead walls and railings above the water prevent the kind of direct interaction that many hoped for. No get-downs to the water have been planned along the waterfront, and the Community Board 1 Parks committee rejected a city design for the nearby Box Street Park mainly based on its lack of waterfront access, sending designers back to the drawing board to come up with a new plan. While McCollum did not explicitly say she would accept Velázquez’s exact recommendation, she did commit to aiding the EPA in the face of President Donald Trump’s budget cuts to the environmental organization. Willis Elkins, a member of Community Board 1 and the Newtown Creek Alliance in North Brooklyn, called access to the water along the Greenpoint/Williamsburg waterfront “lacking.” There are “nice parks that don’t have a great connection or interaction with the waterway,” said Elkins. He pointed to Grand Ferry Park as a positive example, where low-lying riprap allows visitors to interact with the water or sit on the rocks, but contrasted the small, older park (built in 1998, with an update in 2008) with newer, flashier development. The much-touted Domino Park, he said, has plenty of amenities, but offers very little interaction with the water. Same for Greenpoint Landing, which has a riprap shoreline, but prevents access or connection with a railing at the top, along the paved esplanade. No enforcement authority One of the key points at the DCP meeting in Greenpoint was that DCP has no real enforcement authority beyond setting design minimums. Agency representatives were quick to point out that DCP expanded the language to make room for more ambitious “design forward” projects from developers, but so long as the minimums were met — paths so many feet wide, benches every so often, a certain number of trees or square feet of ground cover — they had no real enforcement authority to hold developers to a higher standard. The real estate interests putting up glossy towers full of multimillion-dollar condos were more than welcome to invest in innovative public space along their waterfronts, but only if they wanted to. “We have long sought to build out an extraordinary waterfront for the residents of Greenpoint,” said a spokesperson for Greenpoint Landing in an email. “Throughout the design process, we have listened to the community and continue to do so in designing the next phases of waterfront.” A large section of the Greenpoint Landing project remains to be built, and the spokesperson said that developers will continue to hold meetings with the community and incorporate their comments into planning. They hope to incorporate more green space and natural plantings along the waterfront, with water access “where possible.” The efficacy of community feedback can be hard to measure, however, as any Brooklyn resident who has sat in on a “visioning session” can probably attest. Grassroots efforts to put pressure on developers decades after city planning decisions have been made — and some developments have already been built — is seen by many as too little, too late. Rezoning process offers an opportunity If DCP doesn’t include binding language in their plans for rezoning, accountability for developers could be found in the ULURP process that guides rezoning. But as the community board, City Council and borough president make recommendations to approve developments, their discussions are often more focused on height requirements, air rights and inclusionary housing than they are in design. “It’s my regret I didn’t get on this message five years ago,” Councilmember Stephen Levin said at the Greenpoint meeting in December, acknowledging his constituents’ disappointment in the work. Levin said it wouldn’t be possible to make options into requirements for already approved buildings in North Brooklyn, but urged the community to “speak with one voice” about their expectations. Levin’s district also includes a portion of the Gowanus Canal, which now faces a waterfront rezoning. Though much of the new development along the North Brooklyn waterfront has been approved, and community organization hasn’t materialized on a larger scale, there is an opportunity for Gowanus residents to get ahead of the curve, using the lessons learned on the North Brooklyn waterfront to hold developers to a higher standard. Visit brooklyneagle.com for the full story. “President Trump’s EPA budget declared Superfund, which funds cleanup of toxic and contaminated sites, to be the agency’s top priority, yet cut the program by $130 million,” McCollum told the Gazette. “I reject President Trump’s cynical attempt to undercut the EPA’s work by 31 percent, and I will strongly support EPA programs that protect human health and the environment — including Superfund — as we work to assemble next year’s funding bill.” The $300 millionplus boost in federal dollars for EPA would help revitalize more than Newtown Creek, which straddles the border of Brooklyn and Queens, 1,300 contaminated sites would stand to beneﬁt from Nydia Velázquez’s call for additional funds across the nation, includ- to Superfund sites. Brooklyn Eagle ﬁle photo by Cody Brooks ing Brooklyn’s 1.8-mile Velázquez has previously supported efforts to canal and its 3.5-mile creek, both of which were expand the Superfund program. She proposed a declared Superfund sites in 2010. new “Superfund Tax” on all chemical and large EPA reiterated its commitment to cleaning up oil companies in May to help clean up orphan the nation’s most polluted sites, regardless of sites, where the parties responsible for the polluwhere the funds come from, but noted that private tion cannot be identified or are unable to pay for parties — not the federal government — pay for the remediation. more than 70 percent of Superfund cleanups. The bill would have also awarded a tax deduc(For example, in the case of the Gowanus tion of up to $10,000 for small businesses that Canal, National Grid and New York City are were forced to relocate due to the cleanup process. on the hook for paying for the majority of the The act was referred to the Committee on Ways cleanup.) and Means and the Committee on Small Business, “EPA will continue to prioritize activities but it never moved forward. Velázquez, however, and resources at National Priorities List sites plans to reintroduce the bill to the current Congress. that present the highest risk to human health A similar tax on chemical and oil companies and the environment in accordance with funds was passed in 1980, but Congress allowed it to exprovided by Congress, and supplement that pire in 1995, though it raised roughly $1.25 billion work with funds from private parties,” Ken annually, according to the federal Government Accountability Office. Labbe of the EPA told the Gazette. The wrecking ball is headed for a beloved Bay Ridge Victorian house where a nursery school was located. See page 10INB. There’s a gap in medical research that only you can fill. Join the All of Us Research Program and help speed up medical breakthroughs. • 2 tablespoons shortening • 16 ounces milk chocolate chips • 1 pound fresh strawberries DIRECTIONS 1. In a double boiler, melt the chocolate and shortening, stirring occasionally until smooth. Holding them by the toothpicks, dip the strawberries into the chocolate mixture. 2. Insert toothpicks into the tops of the strawberries. 3. Turn the strawberries upside down and insert the toothpick into styrofoam for the chocolate to cool. A. Alexandru, D.V.M., P.C. G. Swails, D.V.M. N. Ibrahim, D.V.M. L. Mastrangelo, D.V.M. OFFICE VISIT $25. FREE OFFICE VISIT FOR NEW CLIENTS! No Appointment necessary except for Surgical & Dental Procedures. Surgery Monday - Friday Call for Drop Time. Quality Low Cost Health Care for Dogs & Cats, provided by experienced, compassionate Veterinarians and our staff. The wrecking ball is headed for a beloved Bay Ridge Victorian house where a nursery school was located. A grassroots preservation group wants to save vacant 7604 Fourth Ave., which was the Masonic Club before it became Grace Nursery School in the mid-1990s. Bay Ridge Conservancy President Victoria Hofmo said the situation is dire for residents of the grand Victorian house’s block – for a reason beyond the threatened loss of a piece of Bay Ridge’s architectural and cultural history. Next to the turreted wood-frame home there’s an enormous, boarded-up piece of land where a developer demolished Waldeck Funeral Home more than a decade ago. If the Victorian house is torn down, there will be only one building left on the west side of Fourth Avenue between 76th and 77th streets. That’s the United Korean Church of New York, which is at 371 77th St. “How much more can this block take?” Hofmo asked in a recent interview. “I don’t want to see another mess — another empty lot just sitting there,” she said. There is no legal time limit to how long developers can wait to start construction after demolishing buildings on a site. “The law allows property owners to impact our quality of life and erode the neighborhood,” Hofmo said. SOLD FOR $3.5 MILLION IN 2017 Hofmo first realized something was up with the Victorian house when she saw workers digging in its front yard a couple weeks ago. She checked with Community Board 10 and was told the owner of 7604 Fourth Ave. plans to construct condos on the site. There are no construction plans to be found on the city Buildings Department website. The public record does show the Buildings Department approved a demolition application for 7604 Fourth Ave. in June 2018. The application describes the property as a three-story frame and masonry building with a cellar. It identifies the property owner as Grace Holdings BK LLC. An agent for this entity didn’t respond to a request for comment by deadline. Tan Development LLC of Manhasset, Long Island is listed on the demolition application as the filing representative. That’s someone who is involved in a project but might or might not be an owner. A rep for Tan Development said she’s not allowed to speak for the developer and he wasn’t available. City Finance Department records show that Grace Holdings BK LLC bought the Victorian house for $3.5 million from Yumin & John Inc. in September 2017. The Brooklyn Masonic Guild had sold 7604 Fourth Ave. to Yumin & John Inc. in 1995. Eye on REAL ESTATE A lawyer who represented him in the property purchase declined to pass on my questions about the property to him. Zisimopoulos was in the news recently concerning his purchase of Nathan’s hot-dog restaurant site at 650 86th St. A February Brooklyn Reporter story said middle-school construction is planned for the former Nathan’s property. Finance Department records indicate that Zisimopoulos is the managing member of the entity that bought the Nathan’s site. LEFT: This is Bennet-Farrell-Feldmann House, which preservationist groups fought to save in INBrooklyn photos by Lore Croghan the 1990s. Bay Ridge Conservancy sounds the alarm about Victorian house demolition threat — Continued from page 10INB — Hofmo’s family has lived in the Bay Ridge area for more than a century. “Maybe that’s why I take things so seriously,” she said. THE NEIGHBORHOOD WAS ‘GALVANIZED’ The Bay Ridge Conservancy got its start in the1990s as a group that fought alongside other preservationist organizations to save the Bennet-Farrell-Feldmann House at 119 95th St. and an adjacent wood-frame farm building from demolition. The threat “galvanized” the neighborhood, Hofmo recalled. “People came together,” she said. The city Landmarks Preservation Commission designated the house as an individual landmark in 1999. The developer who owned it sold it to a family that has restored it. The Bennet-Farrell-Feldmann House is a Greek Revivalstyle villa constructed in 1847, a Landmarks Preservation Commission report about it says. The farm building next door was not landmarked. The developer tore it down and constructed an apartment building. Hofmo thought the preservationist groups’ partial victory was bittersweet. “I feel like every time a preservationist compromises, they lose. And every time a developer compromises, they win,” she said. This temporary fence blocks the sidewalk outside 7604 Fourth Ave. But back to demolition-threatened 7604 Fourth Ave. The empty lot next to the Victorian house formerly belonged to Mousa Khalil, who for a while was known in Bay Ridge for owning properties he either tore down or kept vacant. The lot’s address is 7614 Fourth Ave. In 2018, an entity called 7614 LLC bought Khalil’s lot for $4,893,687 in a foreclosure sale, Finance Department records indicate. Efthimios Zisimopoulos is the sole managing member of 7614 LLC, those records show. HUGE YARD SALE SAT. APRIL 6th, 8:30am – 3pm 65 Van Sicklen St. (btwn Kings Hwy & Ave S) Something For Everyone. Great Items, Great Prices. MUST SEE! Hylan Blvd/Bayview Ave/Bayview Lane Stunning Two Family Brick Colonial, 8/4, open layout, family room/fireplace, 4 bdrms, huge 2 bdrm rental, quiet/private street. • The first World Series was played between Pittsburgh and Boston in 1903 and was a nine-game series. Boston won the series 9-3. • The unofficial anthem of American baseball is “Take Me Out to the Ballgame,” which is traditionally sung during the seventh inning. • “Take Me Out to the Ballgame” was written in 1908 by Jack Norworth and Albert Von Tilzer, both of whom had never been to a baseball game. • When Jimmy Pearsall hit his 100th home run in 1963, he ran the bases in the correct order but facing backward to celebrate. • The most valuable baseball card ever is the 1909 Honus Wagner T206 card, worth about $2.8 million. • If you keep a goldfish in the dark it will turn white. • A goldfish will eat any fish that fits in its mouth. 8519 4th Avenue, 2nd Flr. • A president kept pet goldfish. Grover Cleveland imported fancy Japanese goldfish for his ponds. He owned hundreds of them. • Goldfish can recognize faces. • The goldfish lives longer than any other domestic fish. For Laughing Out Loud • Can February march? I don’t know, but April may. • Where do fish sleep? In a water bed. • Why couldn’t the shipmates play cards? The captain was sitting on the deck. • What did the cannibal say after he ate a clown? “That tasted funny!” • What do bananas do when the get a sunburn? They peel. • A rabbit hops by IHOP. He looks at the sign. 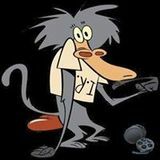 What does he say? “Big deal, do I.” • What do you call a dentist in the army? A drill sergeant. • I don’t know if liquor is the answer, but it’s worth a shot. • My wife and I were happy for 20 years; then we met. • Pampered cows produce spoiled milk. We are a Brooklyn Media company with multiple publications and websites, located in both Bay Ridge and Downtown Brooklyn. We are looking for talented, experienced representatives to work with our growing sales division in print and digital advertising. • Make your own morning or afternoon four-hour shift • Base salary, plus generous commission • Bonus opportunities Must have: basic computer skills, positive attitude, be fluent in English, and have a clear phone voice. Bilingual is a + Great opportunity to make full-time income with a part-time schedule. ADVOCATES FOR SERVICES FOR THE BLIND MULTIHANDICAPPED INC.
(ASBM) is hiring staff to support blind/deaf multihandicapped individuals with intellectual / dev. Disabilities. Bklyn: Asst. Mgr. for BayRidge group home. Exp. preferred. Sign language a plus, but will train. Direct Support professionals needed for Bronx/Brooklyn Group Homes/Brooklyn Dayhab... all shifts, ft., pt, per diem. Bronx: Supervisor positions avail. Experience preferred. Competitive benefits, growth opportunities.